The life of a zombie must be pretty damn simple. Find the living. Kill the living. Eat the living. Repeat. That’s pretty much the daily routine for the living dead. They don’t have to worry about long distance phone bills, overdue library books. Yep. Pretty damn simple. You may criticize our life-challenged brethren for their one dimensional existence, but don’t think for a second that they all fall from the same tree. No, my pal, like us, zombies are rich with distinctive backgrounds and flavors. Like America, the zombie world is a melting pot of colorful characters. Don’t run around thinking they are all mindless killers. Drop your petty pretenses, your unjustified stereotypes and delve in the sociological case study of the zombie community. Ultimately, the genesis of all zombies can be categorized in two major groups. There is Group A: The zombie born of science, and Group B: The zombie born of nature. Both groups contain a wide subset of definitions. For instance, Group A, the science breed, can be a product of a secret military experiment gone awry. They can be a product of a biologically created virus or chemical anomaly. Also in this group are the isolated mad scientist experiments gone awry. In all subsets, notice the operative word. Gone awry. The Group B zombie, spawned from nature is a little easier to classify. These breeds exist purely from the evil. 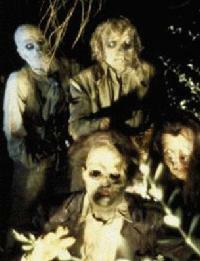 Be it an underworld, demonic impetus, these zombies are simply a spawn to kill for revenge and meanness. For laughs, we can consider them the “Blues Zombies”. Someone has done them wrong during their life. Instead of going down to the crossroads to make a deal with the devil and write a blues song, they just set out to kill and get some payback. 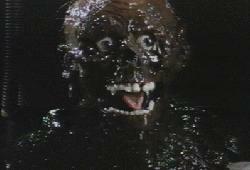 Our first case is the classic zombie, portrayed in such films as Romero’s NIGHT OF THE LIVING DEAD trilogy. This is an interesting phylum to classify. Although the zombie uprising was spawned by radiation (and radiation does exist in nature), it was due to a satellite that fell from space. Thus, having the satellite being the vessel that brings this anomaly to fruition, we can consider the zombies born of science. These zombies prefer the simpleton’s approach with only the most primordial functions of the brain at work. They move methodically, searching for their daily bread, i.e, flesh. They have no need for talking. They prefer to not lead an active lifestyle. This brand of zombie almost takes a communal approach for the hunt for food. They share their kill with the clan. On one occasion, they even use logic to cook the flesh over open flame. Hillary Clinton may have hit home with them. It does take a village to raise a family…of the undead. From the NIGHT OF THE LIVING DEAD to RETURN OF THE LIVING DEAD, we see an evolution of the zombie born of science. Spawned from the biochemical, Tioxin, these zombies possess a little more smarts. They become more animated. Also, while still enjoying the random piece of living flesh, they develop a certain taste for the living brain. 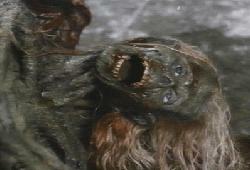 In the RotLD series, we find the zombie can obtain superb strength and agility, as well as a horrible sense of humor. The zombie born of nature is brought about through many forms. The ancient practice of voodoo is a good way to bring the dead back among us. Another way includes the dreadful idea of grave robbing. However, in this phylum, the best way to bring a zombie to its feet is simply by doing them wrong. For a reference of this kind, we can easily turn to a film reviewed on this very site. TOMBS OF THE BLIND DEAD is a classic case of this ilk. The Knights of the Templars were a wronged clan. They were punished and put to death. Be it an evil force or the like, they return from the grave. This phylum is plausible considering that positive, negative, good and evil forces exist throughout nature. We can justify this simply by saying that though unexplainable, supernatural elements to exist in our realm of the cosmos. The Knights of the Templar zombie has no primary function but to kill human and seek revenge. He cares not for sustenance. Just as the knights did while mortal, they remain as a union in their rotting state. They hunt together, using guile and cunning to seek out their victims. The knights posses much more skills of deduction as do most of their zombie brethren. If we wish to introduce a crossbreeding aspect to our study, we could reasonably say that this particular breed can also be linked to the ghoul family. However, we can leave the ghouls for a later study. To bring the natural, or supernatural, aspect more into focus, we can also study Aured’s EL ESPANTO SURGE DE LA TUMBA. In this Spanish case, we find the danger of putting to death an already evil and demonic couple. As mortal humans, the subjects were not nice people. Putting them to death in a grotesque manner is asking for bloodshed from beyond the grave. Of course, centuries later, our demonic couple rises from the grave to get the heir that did them wrong and whoever may fall into their path along the way. This zombie couple, like most of the zombies born of nature, prefers a more sadistic reign of terror and does so with bloody abandon. Again, there is no desire for nourishment, only mayhem. As was the case during the couple’s mortal time, they have a strong link to a dark, “satanic” power. This evil dwelled in their spiritual natural realm and was the catalyst for their unnatural upheaval. This is only scratching the surface of the anatomy of the zombie. Film wise, this horror genre is full of the many facets and idiosyncrasies of the undead. Truly, they are a wide and interesting breed. For some, motives are entirely different. Likewise, their mannerisms, skill set, and evolution are as broad sweeping as their living counterparts. But, all differences aside, the zombies have one common trait that pose a threat to us all. Regardless of their genesis, they will kill you. The zombie should be thought of with respect and fear. Now, perhaps, this will help you better understand the living dead among us and we can all evolve in this diverse melting pot we call life. But I doubt it. They still want to kill and eat you. It has happened countless times throughout the animal kingdom. By cataclysmic forces of nature, changes in the food chain, or the inability to evolve, extinction is an unfortunate reality. It is theorized that perhaps man will be the creator of his own undoing on this earth. Mankind has the amazing ability to harm its evolution simply by its desire for short term gratification. Many scholars believe that it will be our technology that brings the end to our reign as the dominant force of this planet. Like the dinosaur, our bodies will one day become a part of the earth. Mankind will cease to live, unless, as we see in horror films, we return as a member of the undead: The zombie. But even as Mankind dooms its collective mortality, it will fare no better from beyond the grave. As we learned from the previous thesis, the zombie is reduced to its most basic motor functions. One most important function becomes the desire to eat to survive. His only means of sustenance is flesh from a living human. Therein, the zombie must hunt and kill the mortal human and eat his carcass. We have learned in zombie films of two breeds of zombie. One breed simply needs any piece of flesh from the human body. The other breed demands the living brain as his food source. Both demands create the eventual extinction and genocide of their race. The crux of the problem stems from reproduction methods of the zombie. 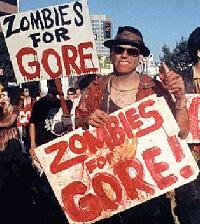 Unlike the living’s use of sexual fertility and coitus to further his species, the zombie relies on killing mortals to propagate. 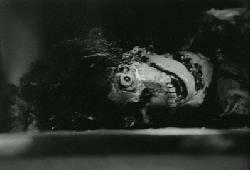 Case in point: Night of the Living Dead. Here, we find that the zombies are essentially dead and rotting corpses. Only the basic motor functions of the brain are kept alive. If the zombie can sink his teeth into a mortal, but does not harm his brain, the wounded human will die only to reemerge as a zombie. There lies the method of propagation. If the mortal is wounded to the point that the brain ceases to function entirely, then no propagation will occur. Remember, the brain stem must remain somewhat active for the “zombie power” to take hold. A big dilemma here is obviously the breed of zombie that must feast on the brain. He is alone killing the opportunity to reproduce. There are two main scenarios that will lead to the downfall of this collective species. One, the zombie that only needs random flesh to gain nutrients can still leave the brain unharmed and propagation can occur. This adds one more member to the population and one less member of the food source. Eventually, this will lead to a lopsided food chain structure. Or, the zombie that requires living brain acts as a scavenger and picks his cranial feast, rendering the mortal vessel useless for reproduction. Better yet, as previously stated, this zombie goes straight for the brain. The zombie that only needs flesh has no want for the dead flesh and thus is left without food. Before long, these two scenarios will leave too much population and not enough prey. In essence, their self-inflicted genocide is perpetuated by the basic drive to consume. Total extinction is the only end to this voracious desire. That being said, perhaps their will be enough left of the living to start anew and repopulate after the great zombie uprising. After the last of the rotting corpses is tossed into mass graves, life will go on and prosper once again. That is, unless mankind failed to see the parallel of the demise. Should mankind continue to propagate, invent and revolutionize without seeing their own self-inflicted genocide slowly taking form, that same basic zombie-like drive to consume will be followed by the ground breaking of their own mass grave. Wow! Zombies sure have the life (or un-life)!